It was a beautiful, crisp Autumn morning and so we managed to muster up a huge team for a canvassing session in Chatham Central. The team included a group of friends from Croydon who had put their own canvassing for fellow candidate Gavin Barwell (who also came) on hold to come help us in our Action Day. In a couple of hours we managed to cover two large polling districts and I now have a number of issues to follow up on over the next few days. Having met in Chatham Town FC's car park, I had hoped to get back in time to watch their game against Hillingdon - but alas my meetings this afternoon over ran and since Chatham lost 1 nil maybe it was for the best! 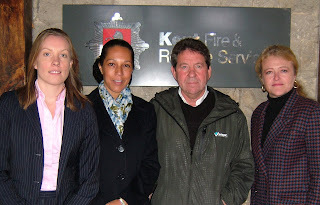 Yesterday I joined fellow Kent candidates Helen Grant, Gordon Henderson and Laura Sandys for an informative session with operators at Kent's Fire Control Centre. We went along to the Centre which is based in Tovil, Maidstone, to demonstrate our support for the centre and staff because it is currently under threat following Government proposals to move it to Hampshire! It is quite clear to us that Kent's Fire & Rescue Services need a control centre that is based locally and staffed with people with an enormous amount of local knowledge - not in a county miles away with little understanding of the geography, the road network, the road works or the special services required for areas like the Channel Tunnel and Bluewater. Yet again it looks like cost cuts are coming before common sense and what we saw yesterday was a service dedicated to the people of Kent which we all believe will be lost if the control centre moves to Hampshire. Can I begin by saying how honoured I am to have been asked to join you today. I didn’t hesitate to accept your invitation and have been looking forward to the service ever since. You invited me to speak about cultural cohesion and how it can be achieved. But I see much of the answer right here in front of me. Your excellent website speaks of the Better Life Assembly as an independent, non-denominational, multi-ethnic church. You are already the embodiment of cultural cohesion bound by a firm belief that the Scriptures are the inspired word of God. Christianity has played and will continue to play a huge role in creating cultural cohesion. The Church of England enjoyed a monopoly in its early history and we had laws restricting the rights and freedoms of Roman Catholics, Jews and even Protestant dissenters. Out of the struggle of those years came the principle of tolerance and religious freedom under the rule of law. A principle that I believe is one of our country’s greatest gifts to the world. And thank goodness because British society today is a mosaic of many nationalities and faith communities. What should give our diversity strength is an acceptance and tolerance of each other’s differences. Every time you open a national newspaper you see that many Countries remain violently divided by race or religion. We are not violently divided but nor have we yet achieved true cohesion. The church does play an important role in our community. And in many respects you are often better placed to deliver cohesion than us politicians. Your vision – life satisfaction, spiritual growth and community enhancement – to which I subscribe to wholeheartedly - gives us a purpose for cohesion but what is the solution? Well I fundamentally believe that the solution to cultural cohesion is to be found locally. It is about people learning to live alongside each other in their local neighbourhoods, accepting each other for who they are not what they look or sound like. It is about local councils who are closer to their communities knowing their area best and understanding what might work and what won’t work. I lived for a few years in Brixton in South London. There are projects I have seen run in black communities in South London that would not work here in Medway. There are problems within those communities that are not prevalent here. Local government should change from being the agent of centrally dictated services, and instead become the enabler of local solutions. It is not about central Government dictating to diverse communities on how to behave, how to work together, and who with. The State should not be a substitute for the community. I also believe that the education system has a key role to play. The Conservative party is very much in favour of faith schools – and has already committed to supporting the expansion of faith schools not least because of the contribution they make to tolerance in society. In addition policies have been and continue to be announced which support and strengthen the family unit which we believe is another fundamental aspect of cohesion. The value of a good education system and a good family unit should not be underestimated and are two areas that my party puts a lot of emphasis on. There is a lot of policy work being undertaken which aims to fix the physical and spiritual breakdown of society that has been caused by an increasingly relaxed attitude towards violence, drinking and gambling. If we can fix these then we are well on our way back to a better society. I have been asked to only speak for 5 minutes so time is running short but I wanted to finish with one final thought. My company operates in 25 countries and employs over 50,000 people worldwide. Despite the differences in time, language, race, or expertise we are all joined together by one employee promise. That promise is “I am recognised for who I am and what I contribute”. For true cohesion to be achieved in our family, our community and our country, we should all aim to be recognised for who we are and what we contribute and we should recognise everyone else for who they are and what they contribute. And for exactly that reason I thank you for this opportunity to meet with you and explore our shared hopes for the future. Every week the Assembly hosts a lunch of traditional foods and this week it was Zambian food so I joined other members of the congregation for some hot food. I think they were slightly surprised that I insisted on having a taster of everything and apart from one side dish, which practically blew my head off, I cleaned my plate. I shall definitely be going back! This morning I went to the Medway Maritime Hospital for a meeting with the Chief Executive Andrew Horne and Chairman of the Foundation Trust Vernon Hull. It was my first meeting at the hospital and it was extremely encouraging. Both Andrew and Vernon are delighted at their Foundation Trust status, and rightly so. Being a Foundation Trust really brings the hospital closer to its patients and the local community and it is clear that its status reflects the high standard that staff strive to deliver. I learnt a lot about the hospital, how it works and the services it provides, and took the opportunity to share with them some of the results from the Health survey in my last newspaper. They were rightly quite pleased with the results - although they were very open about how there is always room for improvement - most people who had been in the Maritime were either very or fairly satisfied, whereas only a handful were not satisfied. I imagine that these survey results, although only small in their number in comparison to the huge number of people they see every year, reflect the time and effort that the hospital makes to consulting with patients on their needs - and long may it continue. Please find enclosed a petition from parents whose children attend Aylesford Primary schools, Teapot Lane and St Peters, in relation to the need for suitable and safe pedestrian crossings for Station Road, Aylesford. Over a year ago Cllr John Balcombe and I had site meetings with Highway engineers regarding safe crossings for Aylesford residents and school children. On Monday 15th September 2008 we received a 10 page email from Highways informing me that they were going to install a Puffin crossing outside Aylesford Railway Station, what great news we thought! Some one has listened at last, we immediately informed the local Schools of this good news. The next day we phoned Highways to thank them, only to be told that it was a typing error and that we are not having a Puffin Crossing but they are going to install a refuge island an uncontrolled aid for pedestrians? KCC Highways have started work today 6th October 2008 outside Aylesford Railway station, to install another refuge island which doesn’t give pedestrians priority over motorist enabling them to cross the road safely. The government are promoting the use of public transport, cycling, walking to help reduce carbon foot print etc, which we are in favour of, but what’s the point of the public using a bus or train only to find that when they disembark the transport, they can not cross the road safely to reach there destination, (it’s like building a house with out foundations) A school walking bus consists of 8/12 children and 2 volunteer adults, how many children can you get on a refuge island? A walking bus has no authority over traffic, it is a high risk for any adult to try and cross that amount of children on an uncontrolled pedestrian crossing, as it’s a high risk for all those young adults who use this route who attend Teapot Lane Secondary School. As Borough Councillors for the ward Aylesford, we listen to the issues and problems the residents put forward to us, we try to resolve and do our best as we have a duty of care for the people, that’s why we were elected, but when we have to tell them for new road schemes, you need points for PIPKIN, then try to explain what PIPKIN is, the answers we receive and expressions on peoples faces say’s it all, and always the main question is, were is the duty of care? At the end of the day we both realise that costing will always be an issue, but we feel that a Zebra crossing or Puffin crossing is the most realistic both for the flow of traffic and pedestrian safety. It would be cost effective and anything else will be a waste of tax payer’s money, especially if it needs to be redesigned or altered at a later date. Commonsense in these issues should prevail. What KCC should be promoting is consultation with local people to find out what they require, which intern will give KCC cost effectiveness’ and value for money for the tax payer. I joined local people at Christ the King church in Princes Park this morning for "The Big Brew Up", a fundraising coffee morning in aid of the Soldiers, Sailors, Airmen and Families Association. SSAFA has been serving the Armed Forces for over a 100 years, providing vital support to personnel and their families on a range of issues. 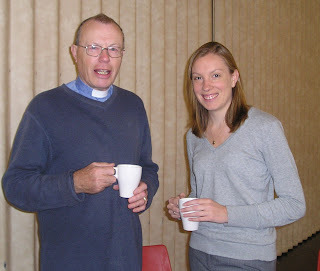 The coffee morning at the church in Princes Park was being repeated all round the world so hopefully the combined effort will raise lots of extra money for the organisation - it is amazing how something as small as buying a cup of coffee and a fairy cake can make such a huge difference! We spent our second Saturday in a row in Larkfield but after yesterday's Government reshuffle I decided to ask everyone I spoke to on the doorsteps what they thought of Peter Mandelson's return to Gordon Brown's Cabinet. I have heard lots from the political commentators so it was time to hear what the general public thought. The response was mixed - although none were positive. They were mostly apathetic, "not interested", "this lot are a busted flush"; or they were totally horrified "It's criminal" said one, "how can a man who has been thrown out twice be put back in a position of power" said another, "dreadful mistake for Brown" offered one chap, and finally one said quite sadly "I have been Labour all my life and now I feel that [Brown] has run out of ideas and bringing back Mandy says it all really...I won't vote next time". I am glad I kept asking the question - from a Westminster bubble perspective, Mandelson's appointment is interesting but the public were not moved at all by his return so maybe it is a gesture that is too little too late for Gordon Brown.